Vodafone has warned it could move its headquarters from the UK depending on the outcome of Britain's negotiations to leave the European Union. The telecoms giant said in an emailed statement it was important to retain access to the EU's free "movement of people, capital and goods". It was too early to "draw any firm conclusions regarding the long-term location for the headquarters". But Vodafone said that it would "take whatever decisions are appropriate". Last week, chief executive Vittorio Colao told the BBC - ahead of the referendum vote - that Britain risked exclusion from plans for a giant new single market in digital services if it left the EU. Vodafone said in the email to several media organisations that EU membership, including the free movement of people, had helped drive its growth. The firm employs 13,000 people in the UK. It has an operating division at Newbury, Berkshire, but the group headquarters are in London. Vodafone said that 55% of group profits in the last financial year came from its European operations, with the UK providing just 11%. The company is also to start reporting its financial results in euros, rather than pounds. Vodafone said the single legal framework spanning all member states, as well as freedom of movement, capital and goods, were "integral to the operation of any pan-European business". The company said: "It remains unclear at this point how many of those positive attributes will remain in place once the process of the UK's exit from the European Union has been completed," it said. Vodafone said it would strengthen its regulatory and public policy activities in Brussels "to ensure the group's substantial businesses within the European Union continue to be represented appropriately". 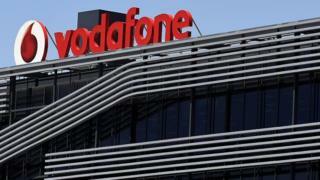 Vodafone is the seventh largest company listed on the FTSE 100, with operations in 26 countries. It employs 108,000 staff outside the UK. Other businesses have expressed alarm at the vote to leave the EU and the consequences of not being part of the European single market. Business Secretary Sajid Javid hosted a meeting of business representatives on Tuesday to discuss the issues. Mr Javid said: "The biggest issue raised was the need to secure continued access to the single market. While I am not in any position to make promises, I assured everyone that my number one priority will be just that in the negotiations to come," he told a news conference after the meeting. After the meeting, the head of the CBI employers organisation said the government was "a long way off" having a plan. "There are very high levels of real and genuine concern in the business community," CBI Director-General Carolyn Fairbairn told reporters.